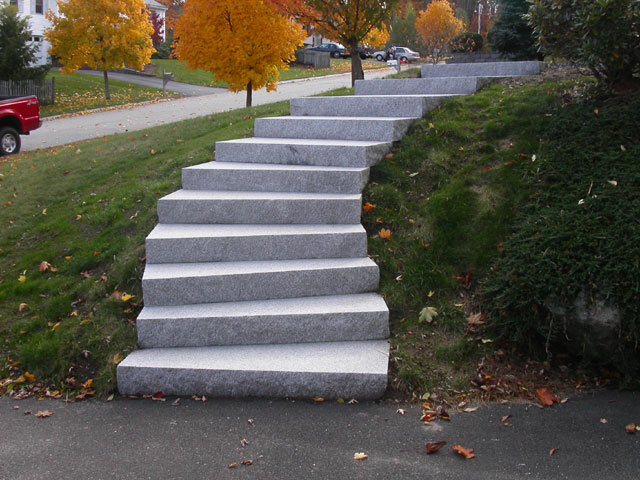 Granite Steps will add beauty and long lasting elegance to your property. Stone structures create a feeling of strength, giving you the knowledge that these structures will last forever. There is nothing like the look and feel of granite steps, walkways, posts, or other structures to enhance your property. We would like nothing better than to design and build something special and different for you. Perhaps you would like replace your steps with granite steps or add a garden gate or a fence built with granite posts to eliminate the problem of rotting wooden posts. Arbors, trellises and shade structures for your patio are all possible projects. Properly installed granite steps and landings should be attractive, comfortable to traverse, and should last a lifetime -- so even in the design phase of the project, we address all critical details. If the previous structure has failed, we would investigate the reason why. We will then measure the slope, exactly, with a transit in order to determine the step tread width to best match the slope. If the steps curve, we also produce a spreadsheet with all the measurements needed for construction. The careful execution of a granite step installation does not lend itself to a large crew. Instead, Tom prefers to handle the job himself in order to maintain a high level of quality control. He installs the steps one at a time, beginning at the bottom, making sure each step has a properly compacted foundation. He uses a Bobcat to transport each step to its approximate location, then uses rollers and levers to position it precisely by hand. Since the granite steps weigh between 400 and 1600 pounds, the installation is both rewarding and impressive. We always receive great feedback from the homeowner! We work directly with a quarry in Vermont that can produce custom granite pieces from our AutoCAD drawings. We have access to extra heavy-duty hinges and can attach either wood or metal to stone for even more design flexibility. The possibilities are endless. Tom is a mechanical engineer by training with degrees from Cornell and MIT. His keen interest in gardens and landscaping resulted from his extensive business travels throughout the world and his purchase of a stately Queen Anne Victorian home built in 1887. Tom and his wife have faithfully restored the house, barn and grounds. Among many landscape projects, he has built stone walls, installed a stunning patio, and constructed raised flower beds from stone. Bluestone walkway with granite edging.